By registering this project with the Scheme, Roadbridge is committed to improving the image and reputation of the construction industry – by caring about its appearance, respecting the community, protecting the environment, securing everyone’s safety and valuing its workforce. In 2016, Dublin Airport became Europe’s fastest growing major airport, with almost 28 million passengers welcomed last year – an increase of 2.8 million passengers over the previous year. This project is part of the construction of a 3110-metre runway, which will be built 1.6km north of the existing main runway. It is expected to be delivered in 2020, to meet the increasing demand at the airport and it will support around 1200 jobs during its development. It will also generate significant employment opportunities in the local supply chain for construction materials. 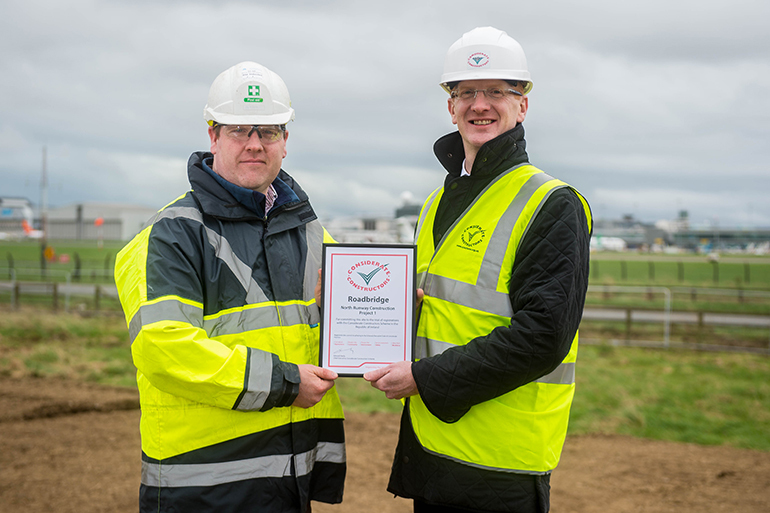 Earlier this year, Roadbridge became one of the very top performing contractors registered with the Scheme, receiving a number of Scheme National Site Awards. We are delighted that Roadbridge has registered this hugely important construction project with the Scheme. 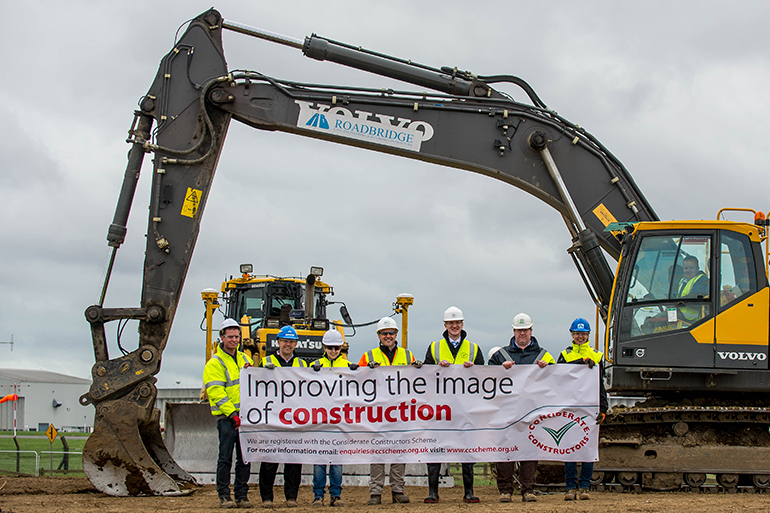 Roadbridge has shown an unwavering commitment to improving the image of the construction industry since it first started registering UK-based sites in 2011. It is great to have Roadbridge and daa championing the Scheme in Ireland, as one of the forerunners in Site Registration. We look forward to Roadbridge’s and daa’s commitment to inspiring other contractors and clients in Ireland to register with the Scheme. Roadbridge are delighted to be able to offer the recognition and positivity that schemes such as the Considerate Constructors Scheme bring to a project, while being an early adopter in Ireland. We have now been audited twice on this project by the Scheme in 2017 and are thrilled to have received an average score of 43 out of 50, which showcases the excellent work being carried out, both in front of and behind the scenes by daa and the Roadbridge Project Team. To put this achievement into context, according to the CCS statistics the average scores to date for 2017 (January to July) across all registered sites, stands at 35.7, so this site is truly demonstrating best practice and embracing the ethos of the Scheme. We look forward to using our experiences of working with daa and CCS to enhance our offerings to future clients. North Runway is of strategic national importance to the Irish economy and for tourism, connectivity and jobs. 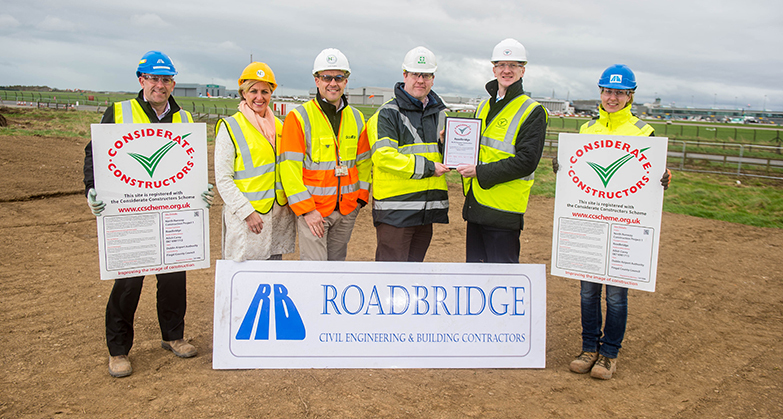 We’re delighted Roadbridge has subscribed to the Considerate Constructors Scheme while working on Construction Package 1 to realign roads around the airport’s perimeter in preparation for North Runway. We would like to congratulate Roadbridge in consistently achieving high scores in audits thereby demonstrating real commitment to the Scheme. Top image from left to right: Peter Byrne (Roadbridge), Siobhan O’Donnell (daa), Justin Hughes (daa), Cathal O’Kane (Roadbridge), Edward Hardy (CCS), Kim O’Meara (Roadbridge).